The calendar had made a commitment to spring almost two weeks ago, but weather conditions have not been very spring-like! We have had, with few exceptions, accumulating snows; cold rains and cold temperatures. Saturday, March 30 had been different!….. Spring!!!!!!!!!!!!! Note the few white bars on the tail feathers. I debated, with myself, what to do this morning that was predicted to be warming. I wanted to go out and enjoy some woodland time. However, much yard work needed done too. My knee pain had been fairly subtle. I wondered if any hill climbing might re-aggravate the pain. A woods walk it will be!!! A heavy frost blanketed the fields and forests as I followed the contour of the hill. Suddenly, I heard it! 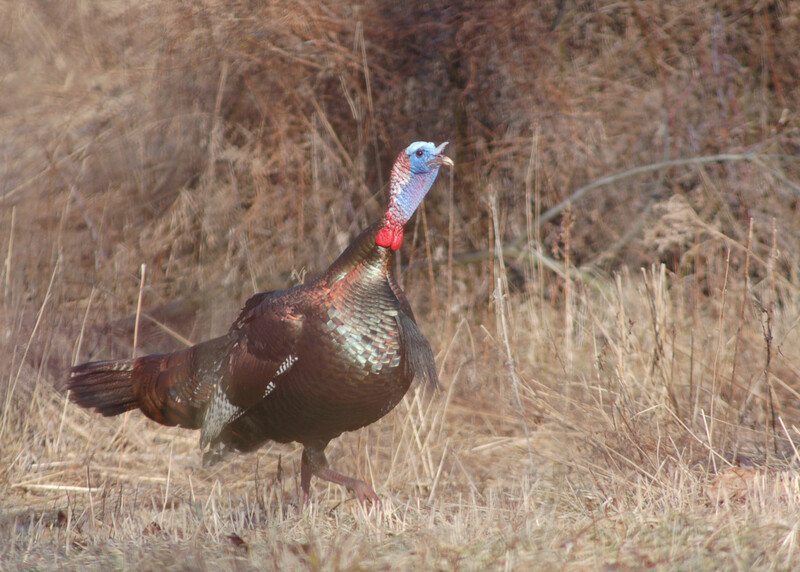 A gobbler sounded off below my position. I walked down over and couldn’t resist making a series of hen yelps. He answered and gobbled periodically. 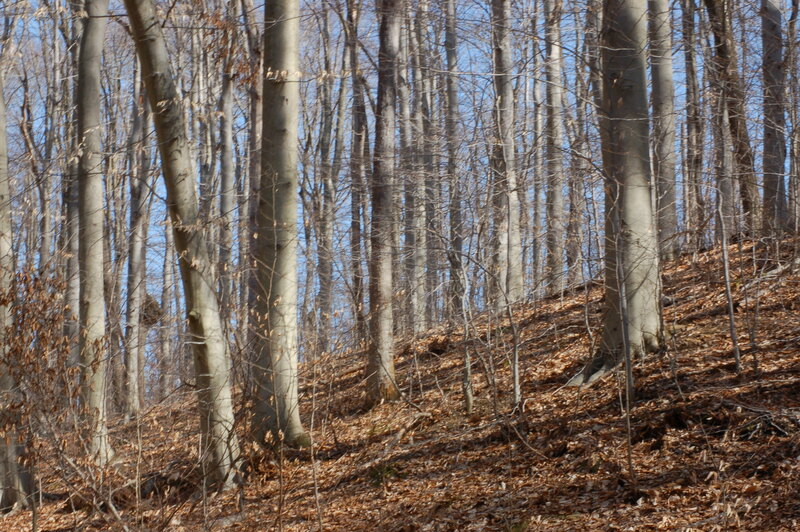 I wondered if he would exit from the woods to come out into the game commission food plots. This would be my only chance for any photos here. The multiflora rose and cut trees were thick everywhere else. Another gobbler began gobbling from the top where I had just walked from. 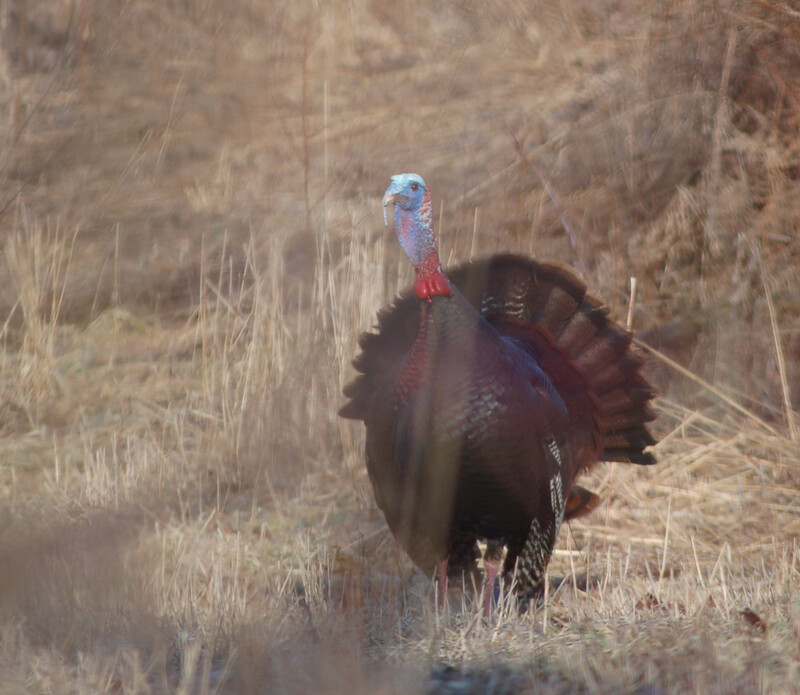 The first gobbler had become quiet and within a minute I could see the “snowball white” head followed by glossy black body outside of the woods. He came towards me fast and I was blessed to get about eight photos. He heard the first click of the shutter and quickly began to show concern. Most of the photos were decent shots. The grasses and briars between the tom and myself did cause some haziness, but the conditions can’t always be controlled in such settings. I walked in a large oval-lile manuever around the property. I even crossed a creek and road twice to spend time in other areas. The walk would be, at least, 5 miles. By 10:00 I could finally feel the warmth of the sun. I saw three deer; four wood ducks and three young gobblers. I bumped into another longbeard. 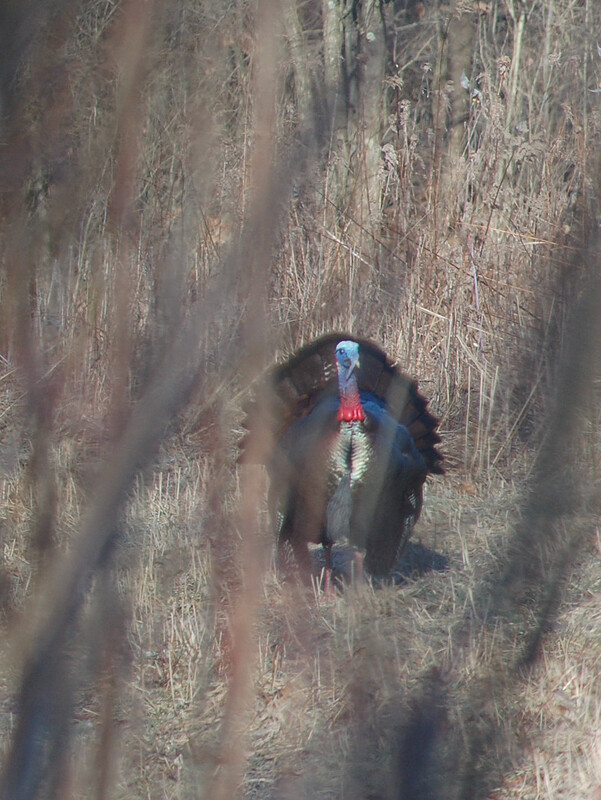 He wasn’t gobbling and we surprised each other as I stepped over a grade! The noise of the wings escaping tthrough the trees is impressive. Of course, I had to remove seven ticks from my pants. They are deceased! I saw my first coltsfoot flower blossoms this day. They are one of the earliest of wildflowers to bloom. The skunk cabbage shots are ready for rapid growth! I heard spring peepers calling for their mates. Yes, spring has finally arrived! Thanks Dana! Glad you liked them. Give harold my best on his knee issues! I know how those aches can alter plans!! I saw a flock near the house still together as a flock on Friday.